as many of you know, football season (both college + nfl) is here! we frequently have family + friends over to watch football, which means that many of my recipes over the next months will be group-friendly appetizers, entrees + sweets. first up? these amazing chicken flautas with avocado cream. 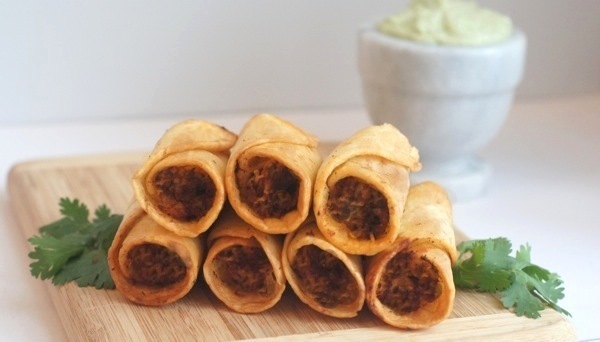 why are these flautas are perfect for football-watching/parties? first, they’re just as tasty at room temp as they are hot – a must for any gathering where people graze + chat over the course of a few hours. second, they’re make-aheadable! i do all the steps except the frying a full day ahead of time + on the day-of, they only take me a few minutes to finish. this is critical when friends are over + you want to spend time socializing or watching the game rather than working in the kitchen. flavor-wise, these are crowd-pleasers. they have enough heat to appeal to spicy lovers without being too hot for non-spicy people. the depth of flavors is amazing + the cool, bright avocado cream is a perfect accompaniment. the last time i served these at a party, they were the first dish to be entirely devoured, which is just about as fabulous a review as possible! whether you’re a football fan or not, the next time you’re looking for a group-friendly appetizer to win over a crowd, give this a try! note: for a healthier preparation, you can easily pan-saute these instead of deep-frying them. instructions on both methods are below. if frying: fill a large pot with enough oil to reach 2” up the side of the pan. heat over medium heat until a deep-frying thermometer inserted in the oil reads 375 degrees. meanwhile, preheat the oven to a warming temperature – somewhere between 180-200 degrees. to make the flautas: in a pan over medium heat, melt butter + saute onions + jalapenos until tender, about 5 minutes. add garlic, cumin, + cayenne pepper + cook until fragrant, another 2 minutes. add chicken + salsa; stir to combine. remove from heat + stir in cilantro, cheese + lime juice. remove from heat + let cool slightly. spread a heaping spoonful of filling along the middle of each tortilla. roll tortilla tightly around the filling + secure with a toothpick. if frying: using tongs, hold each flauta in hot oil until firm, then release to continue cooking. cook until golden brown, about 1-2 minutes, then remove to a paper towel-lined plate + immediately season with salt. repeat until all flautas are fried. if sauteing: heat a large saute pan over medium heat, then add enough vegetable oil to lightly coat the bottom. add flautas to pan (do not crowd) + saute until lightly browned on all sides. remove to a paper towel-lined plate + immediately season with salt. repeat until all flautas are sauteed. once flautas have cooled enough, remove the toothpick. keep flautas warm in the oven on a baking sheet while assembling + cooking the remaining flautas. to make the avocado cream: in a serving bowl, mash avocado, sour cream + lime juice until smooth. season with salt, to taste. to serve, arrange flautas on a platter + serve with avocado cream on the side. Oh I LOVE flautas and these look so great!! Wow, these look amazing! Two of my favorites–Mexican and football food! I’ll definitely be making these this football season (maybe tomorrow, hee hee!). Great job, and awesome presentation. i thought about you, with you mexican food-loving palate, when i made these. can’t wait to hear how you like them! wow these look wonderful! Have a great weekend! Amy…I seriously think you can read my mind. Everything I’ve been craving as of late, you’ve been posting. I need a healthy dose of Mexican food very very soon….I just may try these out! Let’s keep this mind reading thing up….I could get use to having recipes materialize so easily! HA! who knew i was a mind-reader? i should look into making a career out of it. =) i’ve been jonesing for mexican lately, too, + these totally hit the spot. conveniently/dangerously, we have a fabulous mexican restaurant within walking distance of our house – may have to take a stroll up there this weekend since we finished these off last night! That’s it. I’m moving to Nashville and I’m setting up camp in your kitchen. Good Lord those look so dang good. Who wouldn’t eat a whole platter of those?? I’m trying to figure out if i fry those the morning of a game, can I wrap them individually in tin foil and keep them warm in a chafing dish at the tailgate without ruining them. No matter i’m going to try it. And the avocado cream….. I’m dying. come on over – the more, the merrier. =) you could definitely fry ’em in the morning + tin foil ’em but, i’m not gonna lie, they’ll probably lose their crispiness as they ‘steam’ themselves. it might be better to leave ’em uncovered so they stay crisp, then use the chafing dish to heat ’em back up? they’ll be tasty either way – it really depends on your texture preference. LOVE these…always looking for good game-day snacks since we’re big Texans fans around here! Pinning to make one Sunday very soon!!! These were so delicious at the labor day party! I’m excited to see the recipe to try them since I loved them so much. Great to see that I could saute them instead of frying! sweet fancy moses, yes! yesterday, i found myself randomly spreading it on a baguette. sooo tasty. enjoy your enchiladas! renee, the avocado cream is divine. in addition to being great on anything remotely mexican, it would be fabulous on a sandwich instead of aioli or honey mustard. you could make a pretty neat chicken salad with it, too. or toss it with pasta salad. the possibilities are endless! I used to always eat frozen taquitos as a kid (so horrible for you!) and these look like the pimped out version of those! I’ll admit, I’m always kind of intimidated by frying anything at home, but maybe it’s not as hard as I thought! Looks sooo tasty! you know i’m guilty of the ol’ forgot-i-chopped-jalapenos-and-accidently-rubbed-my-eyes move. i swear, it happens every single time! These look like the perfect snack to start the football weekend. The avocado cream sounds delicious. we ate ’em again last night for the NFL season kickoff game, so i can attest that they are fabulous football-watching food! These look so delicious! I’ll have to make them with corn tortillas for a gluten-free version, but other than that they look perfect! Happy football watching!! i love hearing your gluten-free spins on recipes, especially since i have gluten-free friends so am trying to learn more about it. thank you!! Yum! Almost makes me wish we were die hard football fans…just so we could host parties. Maybe I’ll have to have a football party anyways! The avocado cream sounds fantastic! Oh I love the meal ideas for the group-friendly meals because Japanese food can be to difficult for a large group and I don’t know what to serve. Thanks for sharing this delicious flautas recipe! wonderful! there will be lots of group-friendly recipes over the next months since this is the time of year when we host the most parties / gatherings. hope you get a chance to try some of them! I can’t even decide what’s my favorite from all this! Yummi! These look incredible! I love all things avocado, and flautas are a favorite when eating out. May have to try my hand at making some of these at home! chris, i love ’em too + this was my first time making them at home – i was shocked at how easy + delicious they were. you gotta try ’em! Oh my husband would LOVE it if I made these -thanks for the great idea! Now these look GREAT. Avocado cream? Sign me UP. i agree — avocado cream makes everything delicious! I love football and I love game day! 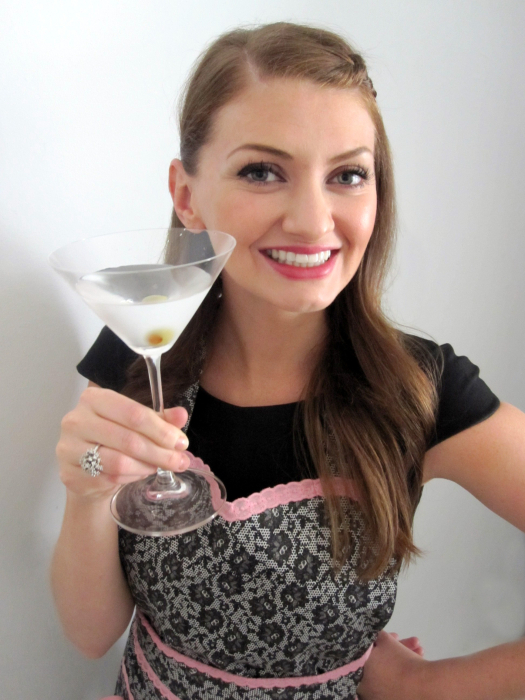 I seriously spend all week devising what I’m going to make for game day…it’s so fun! These would make a fantastic addition…especially that gorgeous avocado cream!! i’m right there with ya – i love planning food for football sundays. =) i hope these turn out fabulous for you if you try ’em – they’re definitely a crowd-pleaser! I’m not sure which sounds better, the flautas, or the avocado cream! both are delicious! + i love that the avocado cream is so versatile – you can use it in tons of different ways. I have been craving Mexican food lately and this will make a perfect addition! I just wanted to leave an updated comment, as I always do when I try a food bloggers recipe. We made these and they were delicious! We pan friend instead of deep fried and oh my goodness. We made them again for dinner (tonight. lol). First, they are so easy to make. I love that I can quickly put it together, and save it even if I want for another night. Second, it just tastes so darn good. This is a keeper. Thanks for the recipe Amy! This is too good not to share so we’ll be featuring in tomorrow’s Taste Test Thursday. Hmm it seems like your blog ate my first comment (it was extremely long) so I guess I’ll just sum it up what I had written and say, I’m thoroughly enjoying your blog. I as well am an aspiring blog writer but I’m still new to the whole thing. Do you have any tips for first-time blog writers? I’d genuinely appreciate it.